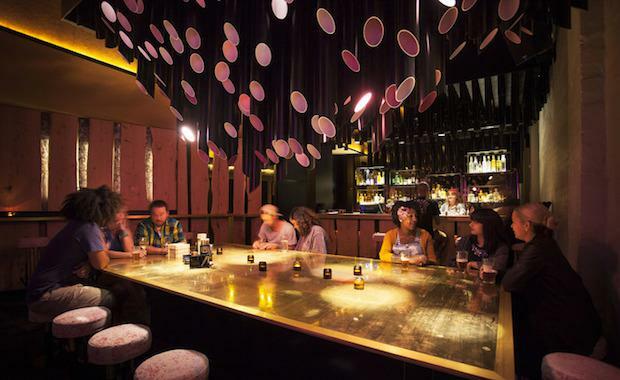 Restaurant & Bar Design Awards held in London. The Australian entrants were up against 860 submissions from over 60 countries, which were judged by the most influential names in design, hospitality and lifestyle. So if you're looking for your next meal with a side of world-class design, these are Australia's top picks. Designed by Figureground, Industry Beans is a roastery, restaurant and brew bar in Fitzroy. Figureground converted a 200 square metre warehouse into a venue that includes a cafe, dining area, commercial kitchen, outdoor seating, administration and commercial facilities, including storage areas. While the space appears industrial, the application of pallets of plywood, communal timber furniture and sustainable materials bring warmth to the space. The double height dining wall is also said to reflect the ambiance of entering an intimate lane way space. The internal facade and front polycarbonate facade feature pivoting and plopping panels to “create a playful habitation” while working to ventilate the space. The breaks in the facade also help drench Industry Beans with natural light. Penfolds Magill Estate Restaurant is located just 8km from the city of Adelaide, and situated adjacent to the Magill Estate Vineyard, Winery & Cellars. Designed by Pascale Gomes-McNabb Design, the space showcases the quality of Adelaide’s colourful wine region. noted the “very artful arrangement of solitaire pieces with a blend of rich materials and colour accents... this provides the space with a sense of elegance and chic...wall decoration lightens up the scene”. Designed by Splinter Society, Melbourne's Howler found its home in a former wool store. The bar doubles as a creative space to host performances and events. Splinter took an “urban oasis” approach to the space, injecting greenery and encouraging natural light.